The Alhambra Theatre welcomes shows including Matilda The Musical (Alhambra is the only Yorkshire venue! ); Motown The Musical; the Royal Shakespeare Company’s Romeo & Juliet; and Mark Morris Dance Group with a unique tribute to the 50th anniversary of The Beatles’ Sgt Pepper’s Lonely Hearts Club Band. St George’s Hall will re-open in February 2019 following major refurbishment with performances by singer Barbara Dickson, comedian Rhod Gilbert and the wonderful Strictly Come Dancing stars Anton & Erin with their new show Dance Those Magical Musicals, amongst others. “We have a terrific season in store for you in spring 2019, packed full of incredible productions, star performers and top musicians. 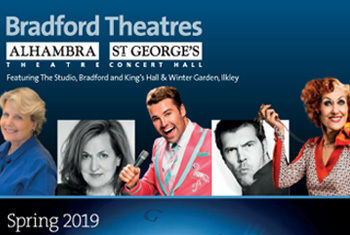 The Alhambra Theatre, just voted the Most Welcoming Theatre in Yorkshire and The Humber for the second year running, has a sensational line-up, with a number of shows coming here on their first UK Tour. Signed: Thur 20 Dec 2.30pm, Audio Described: Wed 2 Jan 2pm & 7.15pm, Relaxed Performance: Tue 8 Jan 6pm, Captioned: Sun 13 Jan 1pm. Hop aboard a magical carpet and fly to Old Peking in this year’s must-see festive show Aladdin. Starring the undisputed King of Bradford Panto, Billy Pearce, stage, screen and pantomime legend, the one-and-only Christopher Biggins and Blue star Simon Webbe. Sandi Toksvig Live! National Trevor - Thursday 10 January - King’s Hall, Ilkley. European Union Chamber Orchestra with Bradford Cathedral Choir - Friday 1 February 7.30pm - Bradford Cathedral. A brand new 80s musical from the producers of the hit UK tour of Hairspray with a star cast led by Joe McElderry ( of XFactor winner and star of Joseph and his Amazing Technicolor Dreamcoat). Captioned: Thur 14 Feb 7.30pm, Semi-Integrated Signed: Fri 15 Feb 7.30pm, Audio Described: Sat 16 Feb 2pm. The Royal Shakespeare Company returns to Bradford with the most famous story of love at first sight. An Evening with Kim Woodburn - Tuesday 12 February - King’s Hall, Ilkley. Swede Dreamz Abba Tribute - Friday 15 February - King’s Hall, Ilkley. Barbara Dickson in Concert - Friday 15 February – St George’s Hall. Fisherman’s Friends - Saturday 16 February - King’s Hall, Ilkley. The multi-award winning musical from the Royal Shakespeare Company, inspired by the beloved book by the incomparable Roald Dahl, Matilda The Musical is the story of an extraordinary little girl who, armed with a vivid imagination and a sharp mind, dares to take a stand and change her own destiny. Spirit of the Dance - Tuesday 19 February - St George’s Hall. Hallé: Carlos Miguel Prieto (Conductor) Sergio Castelló López (Clarinet) - Thursday 21 February - St George’s Hall – Bradford 151st International Orchestral Concert Season 2019. George Todica (Piano) - Friday 22 February - Bradford Cathedral - Part of Bradford International Classical Concert Season 2018/19: Bradford 31st Chamber Season. Little Mix Magic - Sunday 24 February - King’s Hall, Ilkley. Rock ‘n’ Roll Dreams Came True: Meat Loaf the Story - Friday 1 March - King’s Hall, Ilkley. Singalonga The Greatest Showman – Friday 1 March – St George’s Hall. Trust Fast Health With Dr Michael Mosley - Friday 8 March - St George’s Hall. Dan Snow: An Evening with The History Guy - Monday 11 March - King’s Hall, Ilkley. Anton and Erin - Those Magical Musicals - Wednesday 13 March - St George’s Hall. Pelléas Ensemble - Henry Roberts (Flute) Luba Tunnicliffe (Viola) Oliver Wass (Harp) - Friday 15 March - Bradford Cathedral - Part of Bradford International Classical Concert Season 2018/19: Bradford 31st Chamber Season. Hallé: Tomáš Hanus (Conductor) Eric Lu (Piano) - Friday 15 March - St George’s Hall – Bradford 151st International Orchestral Concert Season 2019. The Dreamboys - Saturday 16 March - St George’s Hall. Milkshake! Live - Sunday 17 March - St George’s Hall. Sincerely Yours: The Vera Lynn Story - Wednesday 20 March - King’s Hall, Ilkley. The Counterfeit Stones - Thursday 21 March - King’s Hall, Ilkley. What’s Love Got To Do With It? - Thursday 21 March – St George’s Hall. Dance Consortium presents Mark Morris Dance Group: Pepperland - Tuesday 2 & Wednesday 3 April - Alhambra Theatre – with Post Show Q &A. Mark Morris celebrates the 50th anniversary of Sgt Pepper’s Lonely Hearts Club Band with an exuberant new dance work that revels in the eccentric charm and joyful optimism of The Beatles’ ground-breaking album. Steeleye Span 50th Anniversary Tour - Tuesday 2 April - King’s Hall, Ilkley. Illegal Eagles - Thursday 4 April - St George’s Hall. The sensational hit west end musical is bringing its unique sound to Bradford and is guaranteed to have you dancing in the street! Emma Johnson (Clarinet) with the Gildas Quartet - Friday 12 April - Bradford Cathedral - Part of Bradford International Classical Concert Season 2018/19: Bradford 31st Chamber Season. The Best of Wham! - Friday 12 April - King’s Hall, Ilkley. Stewart Francis: Into The Punset - Saturday 13 April - St George’s Hall. The Johnny Cash Roadshow: San Quentin Anniversary Show - Wednesday 17 April - King’s Hall, Ilkley. Sweet Caroline: The ultimate tribute to Neil Diamond - Thursday 18 April - King’s Hall, Ilkley. Rita, Sue and Bob Too - Thursday 18 – Saturday 20 April - St George’s Hall. A co-production by Out of Joint and Octagon Theatre, Bolton. The smash-hit production of Annie comes to Bradford for one week only, direct from London’s West End. This ‘glorious revival’ (The Times) stars award-winning actress Anita Dobson (EastEnders, Wicked, Loose Women, Chicago, Call The Midwife) as the tyrannical Miss Hannigan! George Hinchliffe’s Ukelele Orchestra of Great Britain – Saturday 27 April – St George’s Hall. The movie Ghost has proven to be one of cinema’s biggest all-time hits. Starring the late Patrick Swayze, Demi Moore and Whoopi Goldberg it was the highest grossing film of 1990 and won an Oscar for screenwriter Bruce Joel Rubin who has adapted his screenplay for this musical. The movie and the musical feature The Righteous Brothers’ Unchained Melody alongside many more terrific songs co-written by Eurythmics’ Dave Stewart. Buttershaw St Paul’s Amateur Operatic & Dramatic Society presents Made in Dagenham: - Wednesday 23 – Friday 25 January at the Alhambra Theatre. A welcome return for one of Bradford’s leading amateur theatre groups.